So you’ve come to Broken Head Holiday Park with the full expectation of having an eco friendly camping holiday. And what exactly does that entail you may wonder? After all ‘eco holiday’ is a bit of an umbrella term really. An eco holiday is one where you can look forward to experiencing the authentic nature – rather than a commercial aspect – of the location you visit. In order for a holiday park like ours to fit the idea of an eco holiday it must sit beside an area of ecological interest (the whole area of Broken Head itself is a nature reserve). Your holiday venue must also be designed in accordance with eco principles ie so that it leaves as small a physical footprint as possible on the environment. Another nice eco holiday aspect about Broken Head is that in coming here you will be giving something back to the community. That’s because our camping site is run by the Arakwal Trust. Under an indigenous land agreement back in 2009, the New South Wales Government gave the land back to the Aboriginal tribe whose ancestors originally settled here thousands of years ago. Their descendants today have, in turn, opened up Broken Head Holiday Park along the principles of openness. So everyone is welcome, families, individuals, couples of all creeds and nationalities. It also aims to give people an affordable holiday. The Trust meanwhile works to improve the lives of Aboriginal people in Byron Bay, as well as the land and water surrounding the area. They do this through shared projects with other conservation and community-based organisations such as the Cape Byron Reserve Trust and the local council. So, apart from the fact you’re helping people who live here by doing some eco friendly camping at Broken Head Holiday Park, what other eco activities can you do on your Byron Bay holiday? Well you could certainly take a trek through some of the amazing nature reserves and rain forests as well as take in the odd tourist path in the locale. In fact, there are two impressive walks which start right here at Broken Head Nature Reserve. One of the walks actually begins from the caravan park! The Two Sisters Walking Track takes you through some wonderful rainforest and all the way past King’s Beach. From the headland of the beach you’ll spot the two sisters themselves (two large rocks) near the coast line. The whole region of Byron Bay is part of what is known as The Wet Subtropics Bioregion, making it one of the most diverse areas for flora and fauna in the whole of Australia. This, in turn, gives it huge eco holiday credentials. In fact, New South Wales boasts the biggest snake, marsupial and frog diversity per unit area of land. Not only that but more than half of the plant species grown in New South Wales are in Byron Bay – thanks to the area’s tropical and temperate climate. Currently there are around 70 plant species and 90 animals in Byron Bay which are protected due to particular habitat or food needs. Other bio areas of interest in Byron Bay and Broken Head include mangroves, saltmarshes, grasslands and wetlands. The wetlands in particular are excellent for bird and turtle sightings whereas you’ll find plenty of oysters, crabs and fish in the mangroves. It’s possible to spot the marine life in Byron Bay by engaging in several water-based eco holiday activities such as kayaking, surfing, diving, snorkelling or even taking a boat cruise. Byron Bay is famous for dolphin and whale watching at certain times of the year and its dive centre at Julian Rocks is one of the best in the world. At the dive centre you’ll find plenty of tiny marine organisms such as sea snails, crabs, starfish, octopus and sponges. 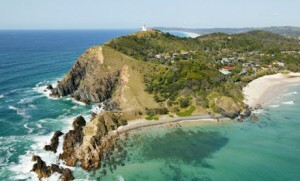 Cape Byron Marine Park stretches over around 22,000 hectares from Brunswick Heads in the north of the region all the way down to Lennox Head in the south. Also included are the tidal waters of the Brunswick River and both Belongil and Tallow creeks. Marine life is in abundance with fish, seabirds, marine plants and dolphins all existing happily alongside more threatened species such as sea turtles and grey nurse sharks. Byron Bay has a relaxed feel about it and you’ll find artisan crafts folk here. Many of them have set up sustainable industries locally using natural materials found within the region – so, you can even take home some eco gifts! Broken Head Holiday Park offers eco friendly accommodation for the green minded! Check out our August eco friendly accommodation special – a seven night stay at one of our unpowered camp sites for just $15 per night for 2 adults. You can even book a full day Byron Bay Eco Tour when you check in on arrival, this is a great way to fully appreciate the biodiversity of the area.